Big 3 Foot Halloween Pumpkin Foam Prop - Dino Rentos Studios, INC. 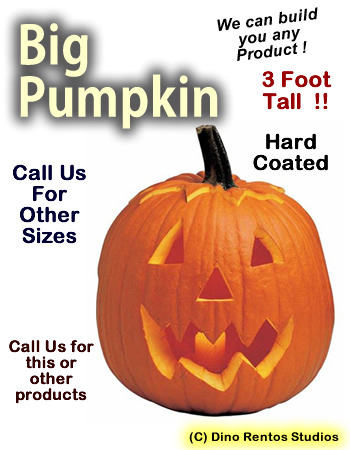 This 3 foot tall by 28 inches round pumpkin prop is great for Halloween retail displays, decorations, stage productions, and more. Hard coated for durability and strength. Open lid to put in battery operated lights (lights not included). Call for shipping discounts on multiple units and for custom props! ATTENTION: Shipping is additional and not shown on invoice. Call us in advance for freight estimate or we will call with freight cost.